A Taste of "Gourmet Galaxy!" This season’s batch of art, production, and marketing interns have been hard at work on an exciting new independent project: Gourmet Galaxy! As we gear up for the launch of the this delicious intergalactic game, we decided to give you just a little taste of what to expect. Brought together by our passion for opening up educational opportunities for kids and appealing to their sense of curiosity and adventure, our brainstorm session was a salad bowl of creative ideas. After tossing together a well-blended mix of concepts, we hit on the idea of space chefs and intergalactic recipes. 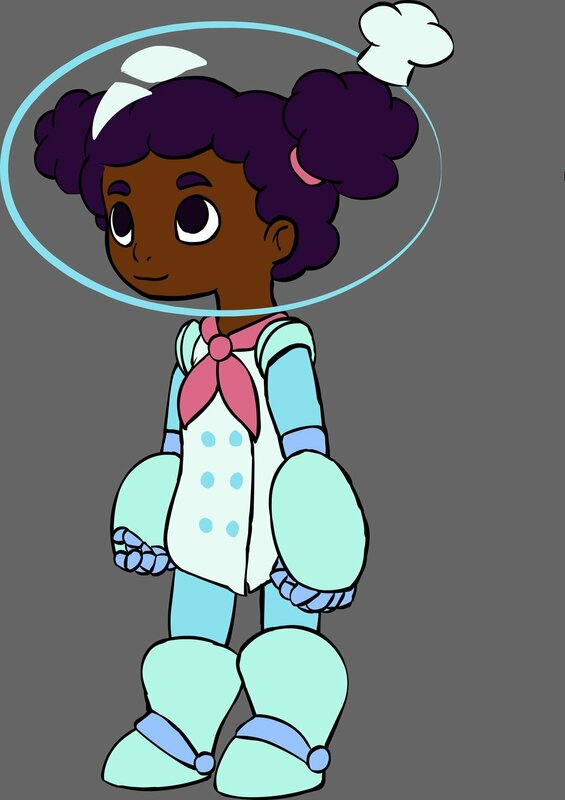 Gourmet Galaxy follows Nutmeg, a space chef in training, as she explores a beautifully illustrated planet full of treats. Her mission: to gather enough ingredients to help her dad make a tasty (and healthy!) meal. Kids, you’re definitely going to want to try this at home! We sat down with the production team to share what went on behind-the-scenes. From character creation to game design docs, we’re giving you the low-down on Gourmet Galaxy. Lucia: For this project I served as a producer. I worked with the team to make sure that we were aligned, on-track, organized and moving towards our big release! I also co-wrote the dialogue and was a part of determining the overall vision for the game. Nutmeg and Chef Poppyseed for the win! Maged: I was a programmer! Maggie: I was the artist and designer on this project. I created Nutmeg, Chef Poppyseed, all the backgrounds, and assets. Sarah: I was the lead animator for Gourmet Galaxy. That means that I animated the walk cycles, idle animations, and pick up actions for game play. I also animated the cutscenes. I assisted in writing the script as well. Allie: I was in charge of creating all the marketing materials for the game. Where do you think the project really pushed you? Maged: I have never worked with sprites as large as this, so it's been a challenge making it all work. I'm more used to pixel art and much smaller (literal) scale things. Maggie: This project was the first time I worked in a professional environment, which was great learning experience! It really put my technical drawing skills and time management to the test. I only had about three months to design backgrounds and assets; I had never worked on a video game before, and I really learned a lot about the production pipeline. Sarah: Making Gourmet Galaxy has pushed me to think more about organization and deadlines. I've had to think about the project and its contributors as a whole, working in a way that works best for the group at any time. I've learned to consider which animations need to come first so everyone has something to work on at any given time -- ie. I needed to get walk cycle and idle animations to our programmer (Maged) before working on a cutscene that can be added later. The production process for projects like ours is more clear to me, and I feel like I can use this knowledge in the future. Production Designer Christina Kelly recording voiceover for Nutmeg. What is your favorite part of what you contributed? What is your favorite thing about the game overall? Lucia: I was an advocate of the measuring portion of the game. Gourmet Galaxy is a whimsical adventure that ultimately leads to a tangible recipe that kids can make in real life with their families. The measuring station is important because it serves as the transition from a fictional world to a child's real kitchen. This feature contributes to math fluidity and self-confidence! Maged: Coming up with a smart way to do dialogue that we can quickly edit, add new character portraits, attach to music, and the like all from one simple XML file has been fun. Maggie: My favorite thing I did was design Nutmeg and Poppyseed! I really enjoyed the challenge of trying to blend the outfits of chefs and astronauts. Sarah: My favorite part has been storyboarding and animating the opening sequence of the game. I am drawn to narratives so this gave me the opportunity to explore the development of our main characters in a fun and expressive way. Plus, frame by frame animation is a personal passion of mine, so it was nice to have the chance to incorporate it into Gourmet Galaxy. Allie: I really loved watching the overall project evolve. I loved seeing the deliverables from the artists. They really set the tone of the game which I loved translating into marketing materials.